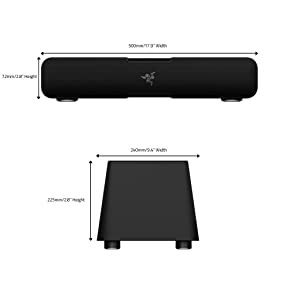 The Razer Leviathan 5.1 Channel Surround Sound Bar easily fits under any desktop monitor or living room console setup. 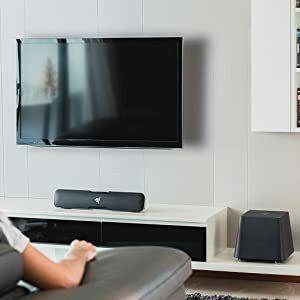 Versatile enough to be repositioned constantly in any situation, this sound bar features cutting-edge Dolby technology, superior sound drivers, and a dedicated subwoofer, projecting rich sounds that recreate epic in-game battle scenes or just streaming your favorite tunes from your smartphone. Enjoy a rich, full-range 5.1 true-to-life surround sound experience with the Razer Leviathan. The Razer Leviathan sound bar features 4 finely tuned drivers that are optimized for incredible virtual surround sound gaming and movies, putting you right in the middle of the action. Seamlessly connects to your Bluetooth devices via Bluetooth v4.0 with the award winning aptX technology for audio quality indistinguishable from a wired connection with an impressive dynamic range. 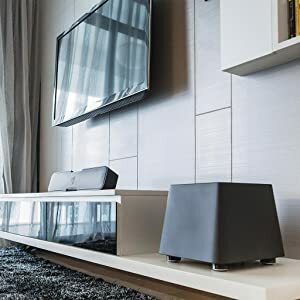 With a connecting range of up to 10 meters/30ft, you can enjoy your music without the hassle of wires. 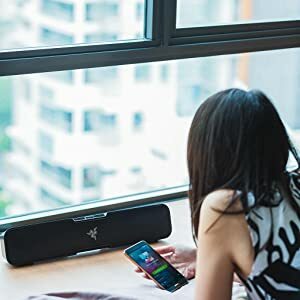 Unlike most sound bars that suffer from weak bass, the Razer Leviathan comes with a powerful 5.25 inch downward firing subwoofer dedicated specifically for the accurate reproduction of bass, and tuned to produce distortion-free lower frequencies, the Razer Leviathan is made to deliver chest-thumping, deep impact bass. 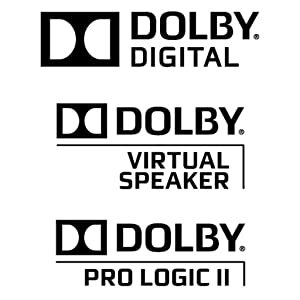 With the combined technology of Dolby Virtual Speakers, Dolby Digital and Dolby Pro Logic II. The Razer Leviathan will convert audio from your sound card, console or set-top box into an incredible 5.1 virtual surround sound stage. 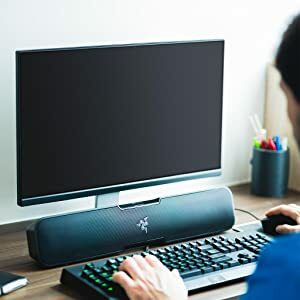 Designed to be compact, at only 50cm /1.6 ft., the Razer Sound Bar is 30% shorter than most standard sound bars, allowing it to fit perfectly under any monitor, in cramped dorm rooms or a smaller study room. Whether you decide to use the wall mount or desktop mount, the Razer Leviathan only uses two cables – one to the subwoofer and one to the power supply, giving you a clean look that complements any configuration. Quickly switch between 3 expertly tuned equalizer settings at the push of a button. 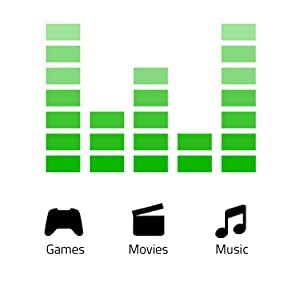 These dedicated sound profiles have been created for the best audio experience for gaming immersion, cinematic movie viewing or enjoying your favorite music.